Cryptomeria trees (Cryptomeria japonica) are also called Japanese cedars and are closely related to bald cypress and redwood trees. In cool winter temperatures, the dark green needles blush to purplish bronze. Beautiful as a singular specimen or grouped in a grove or placed in a line as a tall hedge, cryptomeria is quickly becoming an alternative to the canker-ridden Leyland cypress trees in the American Southeast. Cryptomeria grows well in U.S. Department of Agriculture hardiness zones 6 though 9. Cryptomeria naturally grows in the moist, deep soils of the forests across Fujian, Jiangxi, Sichuan, Yunnan and Zhejiang provinces in China and in southern Japan. It typically grows in mild winter areas at elevations generally below 6,000 feet. A type of conifer or cone-bearing evergreen, cryptomeria attains an upright column- to narrowly pyramid-like shape, 50 to 80 feet tall and 18 to 25 feet wide. Its thick reddish brown bark strips away in attractive vertical lengths, often hidden by the foliage. The wedge-shaped needles/scales occur in five-ranked spirals at ends of branch twig shoots, and always point forward. Female cones appear alone on the branches and bear shield-like scales and teeth, while the smaller male cones are seen in clusters at branch tips. The female cones persist and ripen to dark brown. Plant cryptomeria in a moist, well-draining soil that is deep, rich in organic matter and acidic in pH (lower than 7.0) for best growth. It demonstrates good adaptability to many well-draining soil types, but consider planting it in a sheltered location out of cold or drying winds. It grows nicely in both partial shade to full sun exposures, anywhere with four or more hours of daily direct sunshine. Soils known to harbor nematodes may stunt the growth of cryptomeria plants. Young saplings or newly planted trees remain susceptible to root rot if improperly watered. Watch for needle yellowing and die-back on overly dry or alkaline soils. One of the rare qualities of this conifer is that it readily rejuvenates from harsh pruning. Tall, misshapen or scrawny trees can be cut back to a height of 2 to 3 feet in spring and the tree will re-sprout new stems and foliage, creating a new plant. Such a pruning technique is called "coppicing." It is also used to limit the height of trees in hedges to maintain a particular size. 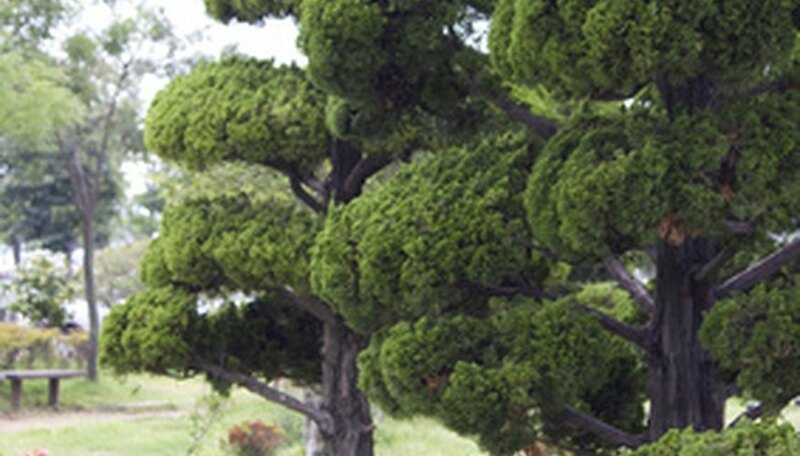 Dozens of cultivars of Japanese cedars are offered in plant nurseries. A particularly fast-growing selection is Yoshino, which can add 2 to 3 feet of new growth annually. Sound choices for tall hedges that max out at 12 to 20 feet in height include Spiralis, Elegans Compacta, Yore-sugi, and Pyramidata. A dwarf variety, no taller than 6 feet at maturity, is Bandai-sugi. How Do Cedar Trees Reproduce?